In this issue: Tommy guns, airships, pirates, alien gods, mercenaries—plus, a contest to name a new entry in the Chicks in Chainmail anthology series. Gritty urban fantasy set in an alternate noir 1930s. Only a handful of people in the world know that mankind’s magic comes from a living creature, and it is a refugee from another universe. Now the Power’s hiding place has been discovered by a predator from a dark universe. 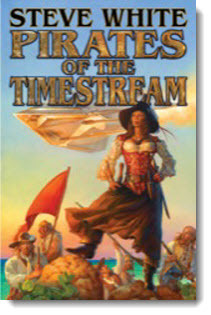 Private eye Jake Sullivan must put together a ragtag crew of airship pirates and Grimnoir knights for a suicide mission to stop the predator before it is too late. Special operations officer Jason Thanou of the Temporal Regulatory Authority must once again plunge into Old Earth’s blood-drenched past to combat the Transhumanist underground and Teloi menace. Jason and his companions travel to the seventeenth century where, with Captain Morgan’s help, the Teloi and Transhumanists are about to face one very effective time travel agent and his team. Cover by Captain Morgan artist Don Maitz. A weekly cornucopia! Find Baen news, and interviews with your favorite Baen authors including Eric Flint, David Drake, Larry Correia and many more, plus the complete audiobook serialization of David Weber’s Shadow of Freedom. 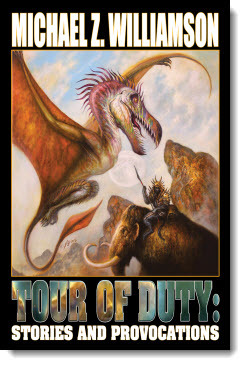 First there was Chicks in Chainmail, carving its way to glory with rollicking tales of, well, chicks in chainmail using their swords and their smarts to defeat the baddies of heroic fantasy—and maybe pick up a few gold pieces in the process. But the pun didn’t stop there; oh no. So far this popular series has seen Chicks 'n Chained Males, The Chick is in the Mail, Turn the Other Chick, and, of course, the omnibus collection, Chicks Ahoy. Now a new series entry dawns. Send us the perfect title for the new Chicks in Chainmail volume. Droll, witty, over-the-top, all of the above? Anything goes! The more puntastic, the better. Gritty urban fantasy set in an alternate noir 1930s. Only a handful of people in the world know that mankind’s magic comes from a living creature, and it is a refugee from another universe. Now the Power’s hiding place has been discovered by a predator from a dark universe. 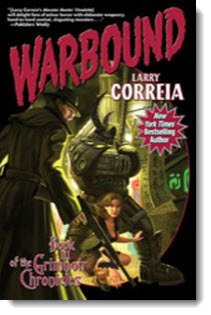 Private eye Jake Sullivan must put together a ragtag crew of airship pirates and Grimnoir knights for a suicide mission to stop the predator before it is too late. Series finale. Special operations officer Jason Thanou of the Temporal Regulatory Authority must once again plunge into Old Earth’s blood-drenched past to combat the Transhumanist underground and Teloi menace. Jason and his companions travel to the seventeenth century where, with Captain Morgan’s help, the Teloi and Transhumanists are about to face one very effective time travel agent and his team. Sequel to Sunset of the Gods. These are stories of the warriors and civilians who get things done in extreme situations, whether it’s rescue from a ship broken in space and leaking air and radiation or scramble and response by troops in the Sandbox doing what it takes to make it through another scorching, rocket-filled day. A hard-hitting collection of the best fiction and nonfiction of Michael Z. Williamson. Don't forget to check out the latest Ebook releases here, plus Baen.com free fiction from Noah's Boy author Sarah A. Hoyt here and monthly free nonfiction, a political and strategic look at hydraulic fracking here. 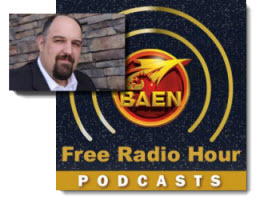 And check out the new Baen Free Radio Hour podcast, new every Friday, here.